Northwestern North Carolina Northwestern North Carolina U-Pick farms: Find a pick your own farm near you in Northwestern North Carolina for fruit, vegetables, pumpkins, organic foods,local produce and more! Looking for a local, pick-your-own farm in Northwestern North Carolina? Scroll down this page and you will see the U-Pick farms in Northwestern North Carolina, sorted by county. Those that offer organic or sustainably grown produce are identified by the words "organic" and/or "sustainable" in Green, next to their name (see "What does Organic mean?"). The U-pick crops they offer follow the name of the farm. To search the page for a specific crop, use Ctrl-F (or on an ipad or Mac, use their "search on this page" function) If they have a website, the name will be in blue and underlined; click on it and it will open their website. If you find anything outdated or inaccurate, see the customer and farmer menus (as appropriate) at the top menu bar to submit updates and corrections and help me keep each current! 2677 Paul Payne Store Road, Taylorsville, NC 28681. Phone: 828-612-6933. Email: [email protected]. Open: daily while Blueberries available; Call ahead. Directions: Click here for a map and directions. Blueberries available approximately June 28 to July 20. Payment: Cash, only. 2150 Friendship Church Road, Taylorsville, NC 28681. Phone: 828-312-8137. Email: [email protected]. Open: PYO Strawberries only; Season begins in May. Click here for current open hours, days and dates. Picking updates: Click here for picking updates. Directions: From Hickory: Take highway 16N into Alexander County (cross the Catawba River at Oxford Dam). Go to the first stoplight and turn route onto Friendship Church Road We are 2 miles out on the route From Wilkesboro: Take highway 16S through Taylorsville. From the interchange at highway 64E/W, travel approximately 5 miles and turn route at the light onto Friendship Church Road We are located 2 miles out on the route. Strawberries May-first of June (Varies annually). Payment: Cash, Debit cards, Visa/MasterCard, Discover, AmEx. Click here for our Facebook page. Our only PYO crop is Strawberries. Note: we do not have other PYO crops, like apples. J and A Orchard - A visitor writes on August 15, 2017: "J&A Orchard is permanently closed. The owners (my parents) sold the orchard earlier this year. l"
63 Ben Eller Lane, Taylorsville, NC 28681. Phone: (828) 632-7209. 410 Swansie Shepherd Rd, Lansing, NC 28643. Phone: 336-384-2774. Email: [email protected]. Open: Dail;y, from 8 am to 6 pm; Blueberries are usually available from late June to early August. 2018 prices are U-Pick price: $2 / quart. If you would like your blueberries ready-picked, call ahead to reserve as ready-picked berries sell out quickly. Local delivery is also available, call us for details. Directions: From downtown West Jefferson. Travel NC-194 N toward Warrensville. In Warrensville, turn RIGHT and continue on 194 N to Lansing. In Lansing, travel STRAIGHT through stop sign (194 N will turn right at stop sign, but don't turn). Road will become S Big Horse Creek Rd/NC-1353. Follow for approx. 1 mile. Turn LEFT onto Little Horse Creek Road (gas station will be on your right). Follow for approx. 2.2 miles. Turn LEFT onto Joe Hampton Rd/NC-1334. Follow for approx. 1.7 miles. Turn LEFT onto Jack Jones Rd/NC-1332. Follow for approx. 0.5 miles. Turn SLIGHT LEFT onto NC-1338/Swansie Shepherd Rd. Old Orchard Creek is at the end of Swansie Shepherd Rd. We host weddings, farm dinners, fundraisers and other special events. For more information, please contact us at [email protected], 336.384.2774, Click here for a link to our Facebook page. 615 Avery Lane, Plumtree NC 28664. Phone: 828-733-5052. Email: [email protected]. Open: Raspberries, strawberries, blackberries. U-pick runs from June til the first frost. Choose and Cut for Christmas Trees late November to December. We sell ciders,(apple,cherry,strawberry,blackberry,raspberry,blueberry,& muscadine) syrups, jams,jellies and vinaigrettes that are made from fruits grown on the farm.Visit with our animals including llamas, goats, donkeys, and more. 251 Charlie Clark Lane, Newland, NC 28657. Phone: 828-733-5543. Email us at: [email protected]. Crops are usually available in September, October. Open: Anytime Ready to harvest, will be gone in 3-4 weeks. Payment: Cash, Check. Approximately 300 bags available. Mountain Cabbage - Rioverde. 7155 Rhoney Road, Connelly Springs, NC 28612. Phone: 828-403-6989. Email: [email protected]. Open: Call before you go: I am open from April to December 7 days a week during daylight hours. Directions: From I 40 west take exit 105, go south 12 miles, turn right on Rhoney Road, drive way 200 yards on right. from I 40 east, take exit 121 to advent crossroads join G. Hildebrand school road, go 7 miles, turn left on hw 18, go one mile, turn right on Rhoney Road, driveway 200 yards of right Click here for a map and directions. Crops are usually available in April, May, June, July, August, September, October, November, December. We use natural practices, but are not yet certified Organic. Payment: Cash, Check. 5480 Wilkies Grove Church Road, Hickory, NC 28602. Email: [email protected]. Open: Tuesday to Friday from 8-6, Sunday 12-6. Directions: From I-40 (east or west) take the Icard/Rhodhiss exit (#116). Turn left off the exit ramp and go about 1.5 to 2 miles. Turn right on Johnson Bridge Road. Take Johnson Bridge Road all the way to the end (about 5 miles) to the stop sign. Go straight through the stop sign and the farm is about 100 yards on the right. Click here for a map and directions. We use integrated pest management practices. Payment: Cash, Check. 6520 Rhoney Road, Connelly Springs, NC 28612. Phone: (828)437-6218. Alternate phone: (828)448-2046. Fax: (828)437-6218. We grow and sell the freshest, tastiest fruit and vegetables that possibly can be grown. We have peaches that ripen from mid June through September. Strawberries are you pick or we pick from late April through the first of June. Blackberries from early June through July. Sweet corn & Watermelons from July till early September and Pumpkins in late September and October. All of these dates can vary with the season, so call before you come for a specific time. 6345 Christmas Tree Ln. , Vale, NC 28168. Phone: 704-276-1835. Fax: 704-276-2563. Email us at: [email protected]. Directions: From Lincolnton Courthouse: Take hwy 27-W for 8 miles. At stoplight turn right onto Cat Square Road. Go 2 miles turn left onto Beam Lumber Road. Turn Right on 1st. hard service Road. John Beam Road Go 2/10 mi, Christmas Tree Lane will be on your left. Click here for a map and directions. Crops are usually available in August, November, December. Open: From Nov 20 to December 20 7 days 9am 6pm Blueberries open approximately July 15 Christmas Trees Open November 20 Payment: Cash, Check, Visa/MasterCard. Lineberger's Berry Hill Farm (Iron Station) - Strawberries. 2400 Hudson Poultry Road, Iron Station, NC 28080. Call (704) 748-1488 for recording on picking conditions. Strawberries start about May st. You-pick and ready-picked. Directions: On Hudson Poultry Road in Iron Station, 5 miles east of Lincolnton. From I-85, take N.C. 27 West through Stanley and Alexis. Just before Iron Station, turn left on Hudson Poultry Road; farm is on left. From North Mecklenburg, take I-77 to N.C. 73 west to Iron Station. Turn left on N.C. 27, go through Iron Station and turn right on Hudson Poultry Road. 4590 Orchard Road, Iron Station, NC 28080. Phone: (704) 732-6637. 178 Hull's Grove Church Rd, Vale, NC 28168. Phone: 704-276-2486. Email: [email protected]. Open: Monday to Friday, from 9 am to 5 pm; Saturday from 9 am to 1 pm; Sunday by appointment only. Click here for current open hours, days and dates. Directions: Click here for a map and directions. Irises bloom in May, Daylilies bloom late-June, Hostas and other plants available early spring through fall. Payment: Cash, only. Click here for our Facebook page. Daylilies, Hostas, Irises, Other Plants. 735 Wise Road, Lincolnton, NC 28092. Phone: (704) 732-1802. Phone: (704) 735-0338. Directions: Located 7 miles west of Lincolnton on Hwy 27 near West Lincoln High School. Open: Monday to Saturday 8 am to 6 pm. Crop availability: Strawberries - April 15-June 5. 226 Mt. Zion Road, Pinnacle, NC 27043. Phone: (336) 325-3331. Phone: (336) 325-2171. Open: Hours and days change during the season - so call before you go - May 2 - June 10; Monday to Saturday 7:30 am to 4:30 pm.Directions: From Winston Salem - Take Hwy 50 North, Take the Pinnacle exit. At top of ramp turn Left onto Perch Road. Go 1 mile and turn Right onto Mt. Zion Road. Patch will be one half mile on your left. From Mt. Airy - Take Hwy 52 South, take Pinnacle exit, turn right at top of ramp, go 1 mile, turn right onto Mt. Zion Road, patch is 1/2 mile on left. Crop availability: Strawberries - May-June. NC Strawberry Assoc. Member. Click here for a link to our Facebook page. 1500 Jessup Grove Church Road, Pilot Mountain, NC 27041. Phone: 336-351-5798. Fax: 336-351-5798. Open: U - Pick is open Mondays through Fridays and We - Pick is open Wednesdays through Fridays, from 9 am to 3 pm. Directions: From Winston-Salem, take Highway 52 North to first Pilot Mountain Exit (Highway 268). Turn right onto Highway 268 and go 1.2 miles to the first stop light. Turn left onto Main Street and go 1.5 miles to the first stop light. Turn right onto Old Westfield Road and go 2.7 miles to the first crossroads. Turn left onto Jessups Grove Church Road and go .5 miles to the farm at #1500 (on the left). Turn onto the gravel driveway and park at the red barn. Click here for a map and directions. We do not use pesticides on the crops. Payment: Cash, only. 113 Hazy Grove Way, Ararat, NC 27007. Phone: (336) 374-2454. Directions: Located 6.5 miles west of Pilot Mountain, take Hwy 268 West out of Pilot Mountain, turn right on Eldor Road, sign 2.5 miles on right. Open: Monday to Saturday 7 am to 7 pm; May 1 thru November 15. Crop availability: Tomatoes - July-September Corn - July-August Pepper & Potatoes - May-November. 6838 US Hwy 601, Dobson, NC 27017. Phone: (336) 386-8598. Phone: (336) 386-4118. Email: [email protected]. Open: Monday to Saturday 7 am to 'til sold out. Directions: Located one mile south of Dobson on Hwy 601. Crop availability: Strawberries - May-June. 6989 Junaluska Rd, Boone, NC 28607. Phone: 828-773-1451. Email: [email protected]. Open: Dusk to Dawn, 7 days a Week. Directions: From NEW MARKET CENTER side of Boone -- Take 194 (towards NC DOT) 1 mile to Howards Creek Road Turn left, stay on road 7 miles. After going on dirt road 1/2 mile, first driveway on right (6989). From COURTHOUSE side of Boone -- From 421/105 bypass, Take 421 (towards Tenn.) 6.1 miles to Tater Hill Road Turn right, go 1.8 miles to end of road, take right on Junaluska Road Go 1/2 mile, first driveway on right (6989). Click here for a map and directions. We use natural practices, but are not yet certified Organic. Payment: Cash, Check. Click here for our Facebook page. We have 235 blueberry bushes... They normally start to ripen around the 2nd week of July through the end of August... Come Visit Us! $8 a Gallon (2015 price). Greene's is formerly known as Lee's Blueberries (now new owners). 2820 Big Hill Road, Boone, NC 28607. Phone: 828-264-3424. Email: [email protected]. Over 90 Variety of Apples Available. Call for appointment. P.O. Box 8, Vilas, NC 28692. Phone: 828-297-4098. Email: [email protected] Organic methods. 711 Old Glade Road, Boone, NC 28618. Phone: 828-264-5738. Email us at: [email protected]. Directions: From Winston/Charlotte on 421 watch for the Blue Ridge Parkway bridge over 421. Go 2.5 miles further on 421(staying on the four land) to Brownwood Road; right on Brownwood one mile; left on Old Glade, bear left .6 miles. From Boone, Hickory, Gastonia on the 421 four lane, go six to eight miles east of downtown Boone(421 S); get in the left lane; turn left on Brownwood; proceed as above. Crops are usually available in July, August, December. Open: all day for blueberries; 9:30 AM to dark for trees Blueberries July 1 to August 15 Christmas trees - the week before Thanksgiving through December 18 Payment: Cash, Check. Field grown rhododendrons. 995 Curtis Bridge Road, North Wilkesboro, NC 28659. Phone: 336-667-8059. Email: [email protected]. Click here for a map and directions. Crops are usually available in May through September. Open: Monday to Friday 10am to 6pm, Saturday 10am to 4pm We use natural practices, but are not yet certified Organic. Payment: Cash, only. 3108 Old Hwy 421, Yadkinville, NC 27005. Phone: (336) 766-6363. Phone: (336) 766-1078. Email: [email protected]. Directions: Take Hwy 421 north to Wilkesboro and cross the Yadkin River. Take the second exit ramp "Speers Bridge Road & Forbush High School". Turn right at the top of the exit ramp and then left at the end of the road. The farm will be 2.5 miles on the left. There will be a sign and a big rock at the entrance of the farm and the property number will be 3108. Open: Wednesday, Friday & Saturday 8 am to 2 pm; July 1 thru August 31. 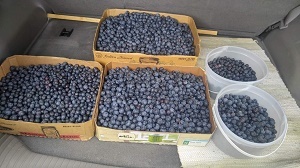 Crop availability: Blueberries - July 1-August 31 Muscadine & Scuppernong - October. 3620 Oakwood Road, Booneville, NC 27011. Phone: (336) 367-7884. Email: [email protected]. Open: Monday to Saturday 9 am to 7 pm. Open on Sunday (Upon Request).